According to artist Paula Crown, the #iamFOR exhibition on display at the For Freedoms headquarters incorporates, examines, and explores themes of environmentalism, racial awareness, and identity politics. 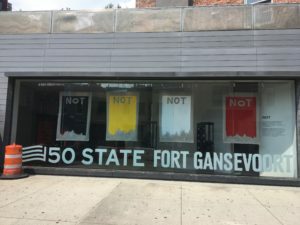 This statement, especially given its location—which is surrounded by all kinds of NYC construction—makes obvious the tangled mess of urbanization, commercialization, and industrialization. Notice, too, how Crown’s piece is juxtaposed with the seemingly dead vines clinging to the lattice work outside the edifice and the winding coils of cables adjoined to the outlet in back of the artwork. What does all this mean? Crown repurposes a historical and picturesque photograph of a mountain-scape used in an advertising campaign for Humble Oil in 1962…Here, the photograph in the advertisement is translated directly into painting, channeling new evidence that oil executives knew of the link between their industry and the consequences of CO2 in the 1970s. 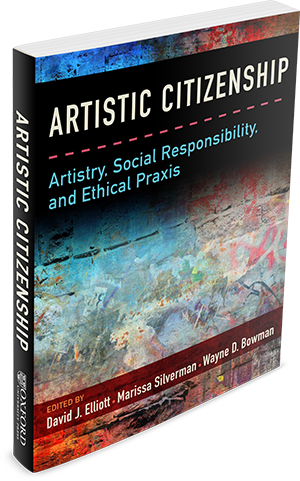 The work references the language of posters and sign-painting to reroute this image from advertisement to activism. In the 18thcentury, anthropologists and cartographers created hierarchies and vocabularies that continue to haunt us, labeling the world with colonial perceptions of human difference. Classification of human beings by color is a social construct dismantled by scientific truth. Artist Paula Crown’s NOT paintings prompt viewers to compare themselves with the subjective taxonomies of the past, to invalidate prior modes of categorization and to demand nuance and agency. 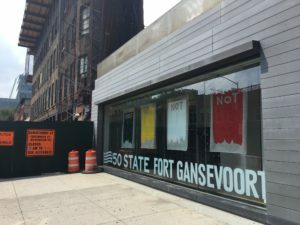 Moreover, it is worth noting that one of the construction signs posted next to Fort Gansevoort, and catty-corner to the Not banners, is a call for vehicles to “use alternate” means of maneuvering through the area. Of course, neither the For Freedoms group, nor Crown, would have expected this kind of coincidence. 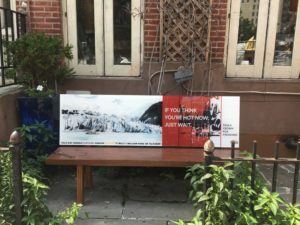 That is, it is provocative that NYC is asking motorists for “caution” and to take alternative traffic routes when Crown invites her artwork visitors to reconsider the routes they use to move through the world! There’s much more to the #iamFOR exhibition. If you happen to be in NYC, be sure to experience it for yourself.